36 OCTOBER/NOVEMBER 2017 | Pr e s by te r i a n s To d ay Make giving easy More and more churches recognize that increasingly parishion- ers prefer debit cards and online banking to cash and checks. As a result, churches increasingly take advantage of online giving in their stewardship strategy. Overall in 2016 online giving grew 7.9 percent, compared with 2015, according to Blackbaud, a software company that provides products for fundraising and charitable giving. Faith-based nonprofits saw a growth of 8.8 percent in online giving. Blackbaud also reported that 10 percent of gifts of $1,000 were given online. "A significant portion of our general offering is received online via our website and the Presbyterian Mission Exchange," said the Rev. Morgan Morse Hay, senior pastor at First Presbyterian Church of Peachtree City, Georgia. About four years ago, the church began promoting online giving on pledge cards and pew cards, in news- letter articles and by asking others to talk about the ease and conve- nience of giving online. Create a legacy Planned giving is a way to create a legacy of faith and return to God that which God entrusted us with during our lifetime. Planned giving also strengthens Christ's church for future ministry and mission. Gaithersburg Presbyterian in Gaithersburg, Maryland, is not shy about asking for support. 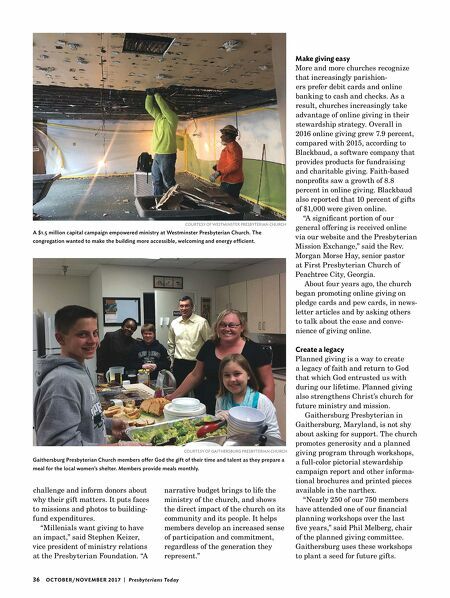 The church promotes generosity and a planned giving program through workshops, a full-color pictorial stewardship campaign report and other informa- tional brochures and printed pieces available in the narthex. "Nearly 250 of our 750 members have attended one of our financial planning workshops over the last five years," said Phil Melberg, chair of the planned giving committee. Gaithersburg uses these workshops to plant a seed for future gifts. narrative budget brings to life the ministry of the church, and shows the direct impact of the church on its community and its people. It helps members develop an increased sense of participation and commitment, regardless of the generation they represent." challenge and inform donors about why their gift matters. It puts faces to missions and photos to building- fund expenditures. "Millenials want giving to have an impact," said Stephen Keizer, vice president of ministry relations at the Presbyterian Foundation. 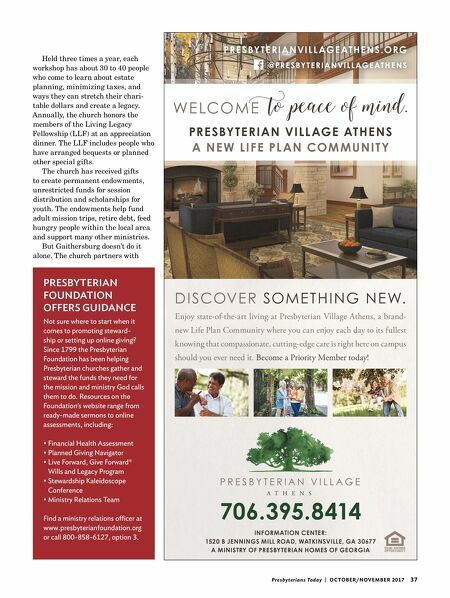 "A COURTESY OF WESTMINSTER PRESBYTERIAN CHURCH COURTESY OF GAITHERSBURG PRESBYTERIAN CHURCH A $1.5 million capital campaign empowered ministry at Westminster Presbyterian Church. The congregation wanted to make the building more accessible, welcoming and energy efficient. Gaithersburg Presbyterian Church members offer God the gift of their time and talent as they prepare a meal for the local women's shelter. Members provide meals monthly.